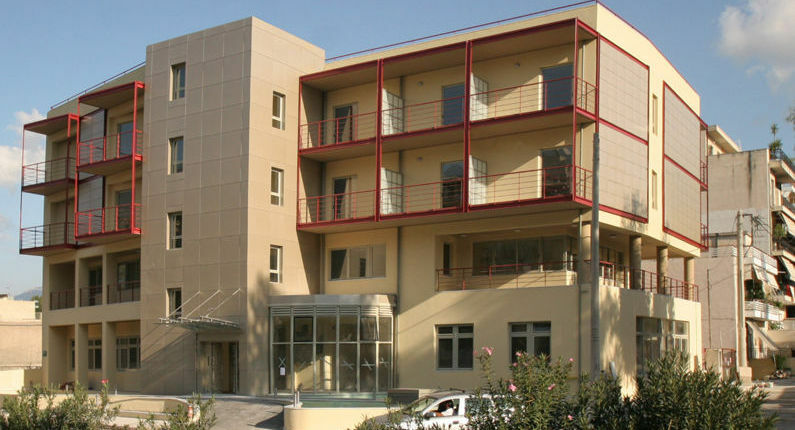 The building is designed to host an exemplary center of recovery and rehabilitation for people with permanent or temporary disability. It is a four-storey building with 2 basements. 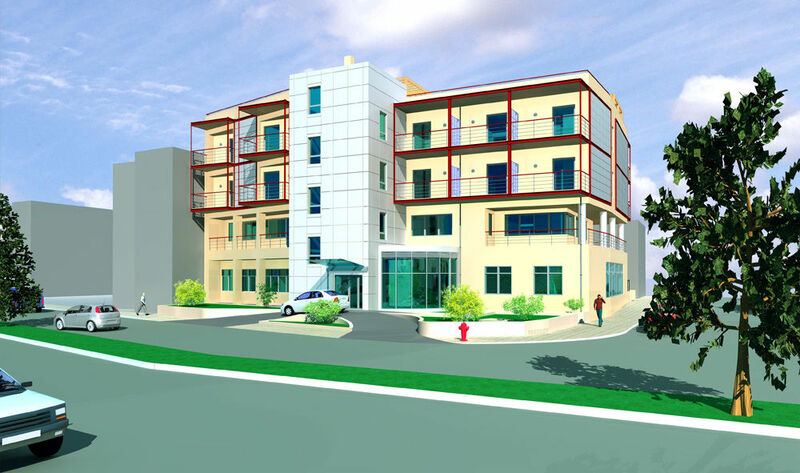 It has 50 beds in total, and many supportive substructures for the rehabilitation. A large area for recreation and gathering is located in the ground floor of the building with a height of 3.20m, which is equipped and designed to help the circulation of patients in wheelchairs and visitors. A swimming pool with therapeutical use is also located on the ground floor. It is a 4.50×5.90m swimming pool designed in three levels with the level of the water higher than the finish floor level, in order to help the carriage of the handicapped patients from and into the pool, with a special lifting tackle, and also in order to help the trainers work. 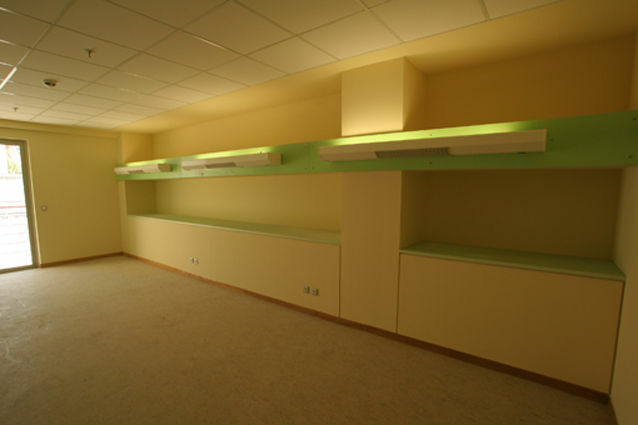 The offices and other exercise and therapeutical spaces are located on the first floor. Indicative examples are the physiotherapy lab, equipped with workout instruments and machines, the self-service room, which is a room designed and equipped like a small apartment with a kitchen a bathroom and a bedroom, used to educate the patients on functional needs, the lab for speech therapy and the examination rooms. The second and third floors are alike and they host 25 beds each distributed in single-bed rooms, double-bed rooms and triclinium rooms. All rooms have a bathroom designed for people in wheelchairs and a balcony. The rest-out area is situated in the center of the story. 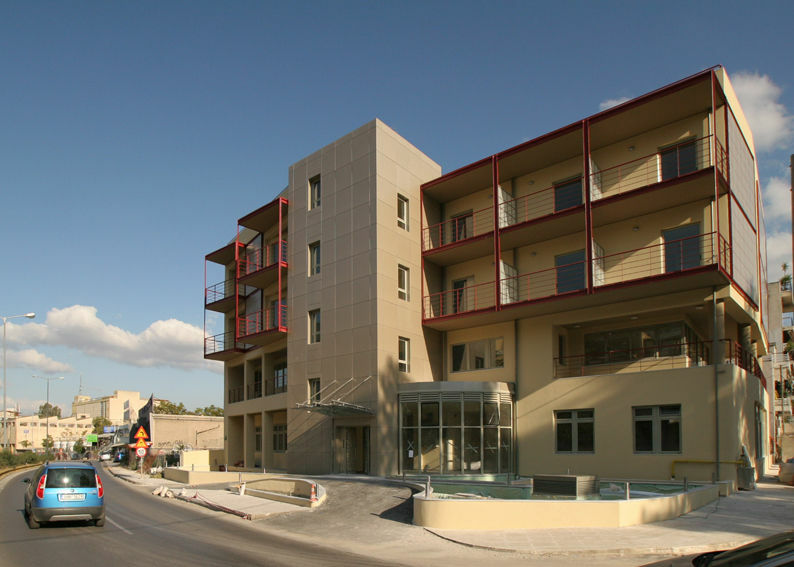 The building is easily reached by car from a small driveway on the entrance of the building on Ethnikis Antistaseos St. in order to accommodate the patients needs. 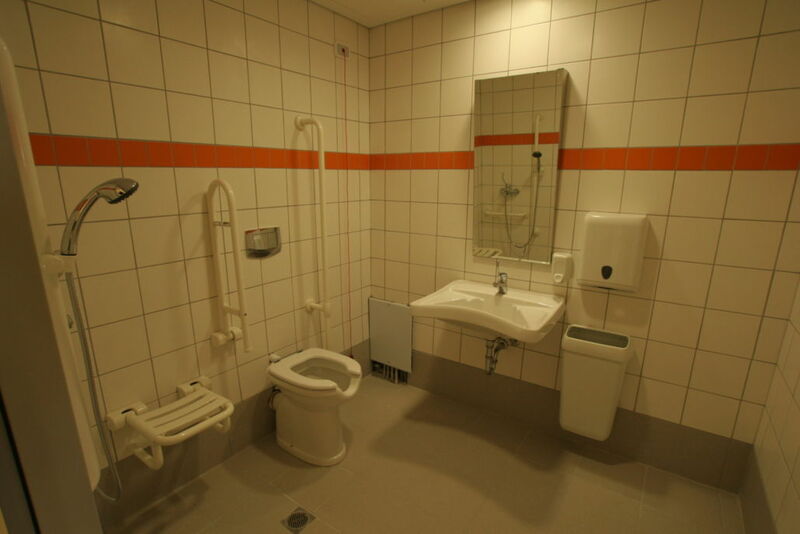 The design of the building has considered all the needs of the disabled. The maximum inclination of all the ramps is 5% and al the hallways have 2.20m width in order to facilitate the movement and crossing of two wheelchairs. The internal circulation and the functional groups of the building are arranged in such way to dissociate the other functions of the building and to help the movement and the orientation inside of it. The building is composed by four basic volumes which, correspond to the different functional groups of the building. These are: the ground floor which being the larger one in area and height consists in being the base of the building,the first floor, which being the smaller in size and the one with many outdoor spaces consists in being the intermediate zone pointing out the ground floor and the upper floors,the second and third floor which follow the perimeter of the ground floor but differ with the balconies,the stairwell which by being vertical units all the above mentioned volumes. The building’s volume is further completed with the arrangement of the elevations elements, the materials and the variety of the openings.